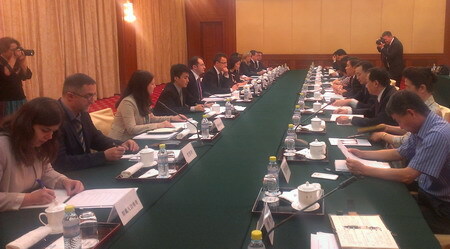 (Beijing, 9 June 2014) First high-level meeting of the Joint Working Group on China-Serbia-Hungary Transport Infrastructure Cooperation, regarding the project of modernization of the railway Belgrade-Budapest, took place in Beijing on 6 June 2014. Delegation of the Republic of Serbia was headed by Dejan Trifunovic, State Secretary for the Ministry of Construction, Transport and Infrastructure of Serbia. In the delegation were also Miodrag Jocic, Assistant Minister for railways and intermodal transportation and from the Embassy of Serbia in Beijing Charge d’ Affaires a.i. T. Panajotovic Cvetkovic, counselor M. Stefanovic and third secretary M. Kuzmanovic. Chinese delegation was led by Mr. Xu Xianping, Vice Chairman from the National Development and Reform Commission (NDRC) of China, and Hungarian by Mr. Péter Szijjártó, State Secretary for Foreign Affairs and External Economic Relations of the Prime Minister’s Office of Hungary. Representatives of the three sides discussed objectives, principles, major tasks and modalities regarding this project, which plays an important role in the cooperation between China and Central and Eastern Europe.